Moore & Lee is honored to be listed in the Chambers Guide to the World’s Leading Lawyers. Chambers, USA, “America’s Leading Lawyers in Business” also lists Mr. Moore as one of the leading lawyers in Construction Law. Mr. Moore was included in the inaugural list of lawyers listed in The Best Lawyers in America (2003-2004) concentrating in Construction Law and has been included in each subsequent list. Mr. Moore is rated as AV Preeminent by Martindale-Hubbell and is listed in Super Lawyers®, The Top Lawyers in Virginia Super Lawyers®, The Top Lawyers in Washington D.C., Who’s Who Legal: Construction and Super Lawyers®, Corporate Counsel Edition. Mr. Moore has also been honored by the Virginia Business Magazine as one of its Legal Elite. 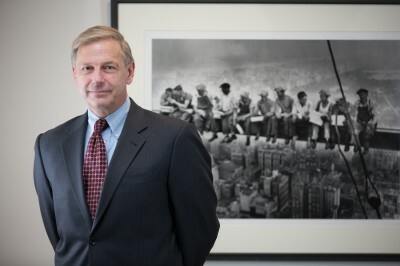 Robert M. Moore is a founding partner of Moore & Lee, LLP, a firm that concentrates in all aspects of construction law. Previously, he was a partner in the Government Contracts and Construction Law practice group of the Washington, D.C., office of Morgan Lewis & Bockius. His practice focuses on federal procurement law, government and commercial construction contracts and involves drafting and negotiating domestic and international construction contracts, counseling in contract administration as well as the evaluation and preparation of claims arising under such contracts. Mr. Moore’s primary practice emphasis, however, has been in the resolution of disputes, including both government and commercial contracts. His government contracts practice includes both bid protests and claims. He has represented government contractors involved in various industries, including weapons systems, translation services, military base and housing constructions and consulting services. In his commercial construction practice, Mr. Moore has litigated disputes on behalf of owners, contractors, subcontractors and suppliers before federal and state courts throughout the United States, domestic and international arbitration panels. These representations have involved a variety of projects, including power plants, wastewater treatment plants, dams, hospitals and office buildings. Mr. Moore has lectured on topics such as management of project risk, preparation and defense of claims, international arbitration and the effective presentation of expert witnesses. He has written or co-written articles on government contract and construction law issues, including international dispute resolution, defense of conflicts of interest and problems in contract formation. Mr. Moore is a member of the American Bar Association’s Public Contract Law Section, the Construction Litigation Committee of the ABA’s Litigation Section and the Construction Law and Public Contracts Sections of the Virginia State Bar. He also served as chair of the Board of Contract Appeals Bar Association’s Trial Preparation and Advocacy in Federal Procurement Program Committee. The Matthews Group, Inc. t/a TMG Construction Corporation, B-408003.3 et al., 2014 CPD P 104 (Comp. Gen., Mar. 21, 2014), 2014 WL 1273855. Raytheon Missile Systems, ASBCA No. 57594, 11-2 BCA P 34854 (Oct 11, 2011). P&J Arcomet, LLC v. Perini Corp., 2007 WL 3470241 (E.D.Va. 2007). SOS Interpreting, Ltd., B-293026 et al., 2005 CPD P 25 (Comp. Gen., Aug. 15, 2004), 2004 WL 3168962. Brickwood Contractors, Inc. v. U.S., 288 F.3d 1371 (Fed. Cir. 2002). Power Services, Inc. v. MCI Constructors, Inc., 2000 WL 459436 (E.D.Va. 2000). General Graphic Services v. Department of Health and Human Services, 96-2 BCA P 28,508 GSBCA No. 13541-P-R (G.S.B.C.A., Aug 2, 1996). Volt/Alphanumeric Publication Systems v. Department of Navy, 96-1 BCA P 28,184, GSBCA No. 13195-C (G.S.B.C.A., Jan 26, 1996). McDonnell Douglas Corp., B-259694, 95-2 CPD P 51 (Comp. Gen., Jun 16, 1995). Grumman Data Systems Corp. v. Department of Navy, 1995 WL 100801, GSBCA No. 13172-P (G.S.B.C.A., Mar 8, 1995). Harding Lawson Associates; ICF Technology, Inc. – Reconsideration, B-239602, B-239231, 90-2 CPD P 450 (Comp. Gen., Dec 4, 1990). Protest of Chesapeake & Potomac Telephone Co., 1990 WL 92716, GSBCA No. 10331-P, GSBCA No. 10484-C (G.S.B.C.A., Jun 28, 1990). McDevitt & Street Co. v. Marriott Corp., 713 F.Supp. 906 (E.D.Va. 1989). Protest of AT&T Communications, Inc., 88-2 BCA P 20-805, GSBCA No. 9252-P (G.S.B.C.A., May 17, 1988). Mr. Moore was born in Ft. Knox, Kentucky.